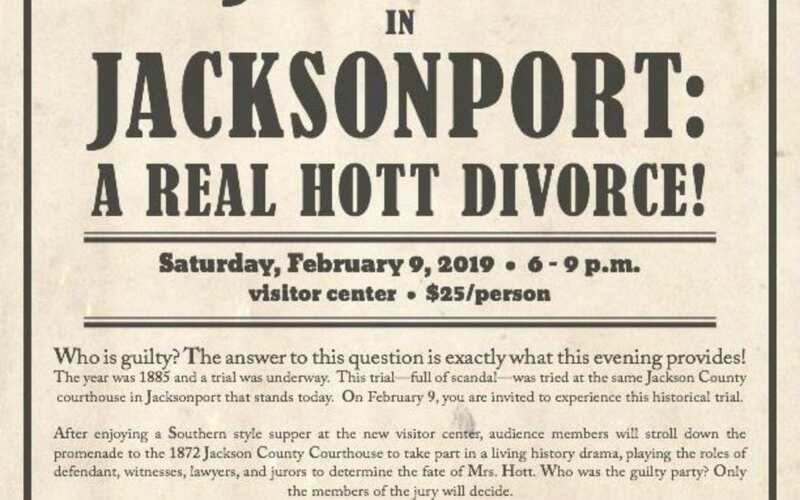 On February 9th, Jacksonport State Park will present “Justice In Jacksonport: A Real Hott Divorce.” This trial is based on actual events that occurred in Jacksonport, and were tried at the Jackson County courthouse in Jacksonport during the fall of 1885. 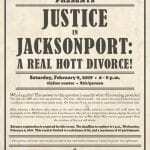 Divorces were rare in the 19th century and the Hott divorce was one of a very few to take place in Jackson County. This trial – full of scandal! – was tried in the same Jackson County Courthouse that stands today! After enjoying a Southern Style Supper, audience members will take part in a living history drama, playing the roles of defendant, witnesses, lawyers, and jurors to determine the fate of Mrs Hott. Who is the guilty party? Only the members of the jury can decide. Please call 870-523-2143 to make your reservation soon. Space is limited and the deadline to register is 3 p.m., February 6th. Come on out to Jacksonport State Park to have a wonderful time and meet new friends. Minimum of 30, maximum of 40 participants. The Visitor Center and Courthouse are fully accessible to those with mobility limitations. For more information, please contact the park staff at Jacksonport State Park, 205 Avenue Street, Newport, AR, 72112, telephone: (870) 523-2143 or email: Jacksonport@arkansas.com.